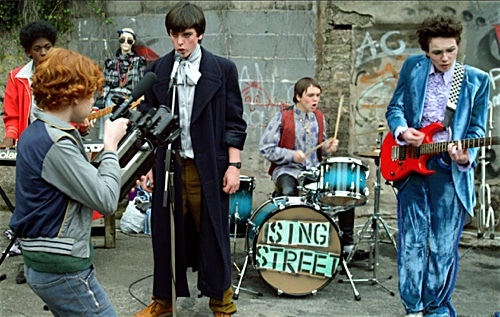 “Sing Street,” written and directed by John Carney, falls into the familiar plotting which involves a teenager living in the dreary inner-city Dublin who manages to find an outlet for his thoughts, emotions, wants and needs by forming a band with his peers. However, undeniably fresh about the picture is its confidence of execution. The final product could have turned out to be yet another musical for teens where scenes merely parade the screen in order to build up to the next performance, but notice there are a handful of interesting characters to be found here. Particularly touching through an occasionally comic lens is the relationship between brothers. Conor (Ferdia Walsh-Peelo) is the youngest of three and he seeks romantic and musical advice from his eldest sibling, Brendan (Jack Reynor), the university dropout. Their exchanges, while amusing at times, command a realism to them that viewers with brothers will immediately recognize and inevitably relate with. Brendan is seen by the family, particularly the parents, as a bum but Conor regards him as someone trustworthy and of high value. Recognize there is not one scene that show parents relating to their children in a meaningful way. That missing relationship strengthens the brothers’ bond. Set in 1985, the film is filled to the brim with music by Duran Duran, The Cure, Hall & Oates, among others. But the original songs shine, too. They are energetic, clever, well-written, and meaningful. Perhaps the most interesting sections of the material involve the recruitment of band members and trying to figure out what kind of music they wish to make. I enjoyed that we are able to see a clear improvement and progression not only in terms of songs but also in how the characters appear to have increased their confidence with each passing performance. Throughout the picture, we get the impression that the band is continuing to grow and evolve. I wished, however, that a few of the later songs did not sound so polished. Take note of the pop ballads and how effective they are because what is showcased is the voice and only one or two instruments to build the tempo. The polished feel gives the feeling that the teens have made it big eventually but the story is never about becoming pop stars or celebrities. It is about outcasts coming together and creating art out of their trials and tribulations—whether it be with parents, authority figures at school, or trouble with getting girls. Nice review! Although I can’t really agree with your statement about the film needing a bigger focus on the band members at the expense of Raphina. It was bad enough that the film didn’t have more than one substantial female character and if she would’ve been reduced to an even less screen time I would probably stop watching somewhere halfway through. Anyhow, I otherwise really enjoyed reading your take on the film! I love this movie so much that I went to see it three times in the theaters. I first saw it when it screened at the Sundance Film Festival in January and no film has even come close to being as great as “Sing Street.” It’s my favorite film of 2016 so far. I hope more people will watch it and it’ll get the audience it deserves now that it’s available for home viewing. Enjoyed reading your review!